One of the most beautiful and popular traditions of the Orthodox Church is the solemn blessing of Paschal food on the feast of the Resurrection of our Lord. 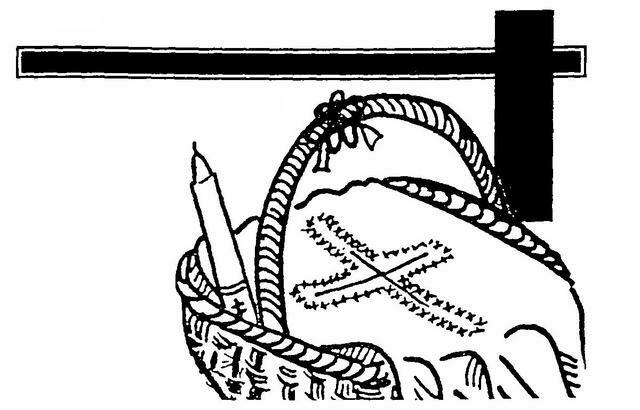 It is not difficult to prepare such a basket which adds immensely to the festive character of this radiant holy day. It is an engaging and impressive practice which we have the honor of handing down to our children and grandchildren. Formerly, the discipline of the Church through its rigorous fasting prohibited the eating of meat and dairy products during the entire season of the Great Fast. Naturally, at its conclusion, people instinctively wanted to celebrate the triumphant feast with a banquet of all foods they could once again eat. We exhibit our joy and gratitude by taking our food to church to be blessed. Christ Himself often described the heavenly kingdom as a "banquet." By sharing food with the disciples after His Resurrection, our Savior desired to demonstrate that the kingdom of God was already inaugurated and present. Liturgically partaking of the paschal foods reminds us of participation in the divine joy of Christ's eternal kingdom. How many of us, though, have given any serious thought to why we include the foods that we do? The traditional foods have become traditional for a good reason! The foods blessed for the feast of the Lord's Passover from death to life are among those which our God prescribed centuries ago, 'in the Old Covenant for the ancient Passover meal: lamb, bread, wine and bitter herbs, along with a Christian component added later in time. 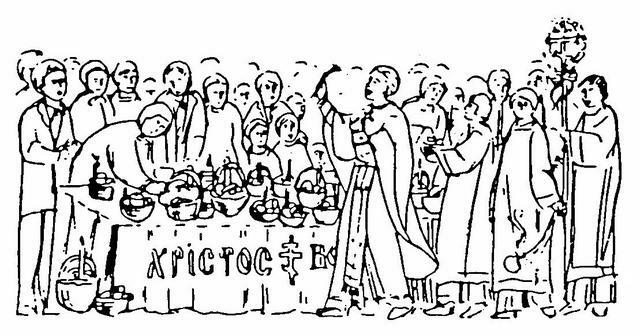 Generally, the Paschal basket is brought either to Resurrection Matins after which the solemn blessing of the Paschal foods is celebrated or, more traditionally, it may be brought to the Resurrection Divine Liturgy after which these foods are also blessed. However, it is most important to remember that they should not be eaten until after the feast day Divine Liturgy during which we break the preparatory fast of Passion Week by receiving first the angelic food, the food from heaven, the Body and Blood of our Lord in the Eucharist. Then we will be physically and spiritually ready and prepared to eat and enjoy the labor of our hands in the grace and light of the Resurrection. Please remember that if we have faithfully abstained and fasted from these foods for the duration of the Great Fast, they especially will delight our taste buds as we victoriously celebrate Christ's triumph over death and the grave. The practice continued from early times among our ancestors and spread even among Christians of the Western Church. Brought to the United States by our immigrant forbears, its popularity is increasing and has deep meaning for many who appreciate its value as a holy and worthwhile family tradition. Here is some information by way of explanation that you may come to better understand and appreciate this holy practice in the lives of our faithful. It will also help you in addressing questions some of your holy day guests may have as they join you in your family celebration. It is information that may also be shared with children for their better understanding. Pascha. The large round loaf of bread made of wheat flower, eggs, milk, sometimes raisins, symbolizes our Lord Himself, Who is the Living Bread, come down from earth. Infused as it is with yeast, it shows us Christ is our nourishment and support in life through His grace and salutary assistance. Never called mere bread on this feast day, Pascha, like bread, reminds us of the risen Lord, Who in the Eucharist is the food of our earthly journey and the true bread of our everlasting life. 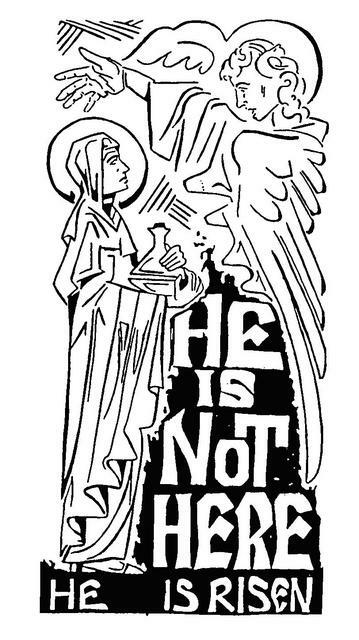 He comes among us to impart divine life in the Eucharist. Just as bread is the "staff of life," Christ is our spiritual sustenance for eternal life. This Pascha reminds us, as does the Eucharist, of Resurrection triumph and initiates us into this sacramental Mystery. The Pascha is decorated with braids, wreaths, plaits of dough, cut out flowers and designs to remind us of the crown of thorns and the crown of victory which was His after the solemn triumph from the grave. It takes its name from the very feast and truth it symbolizes. It is distinctly different from any bread made the remainder of the year and its contents are particularly unique to the celebration of the Resurrection. Cheese and Butter are dairy products which remind us of the richness of blessed life in Christ with which we have now been endowed because of the Resurrection victory of Jesus Christ Who opened the gates of heaven for us. Sometimes the butter is molded into the shape of a lamb recalling Jesus Christ as the Lamb of God sacrificed on the altar of the Cross for our sins and the life of the world. This may be commercially obtained or created from scratch by utilizing the base heavy cream. The balls of cheese are specially prepared from eggs and milk usually only for this feast. The cheeses remind us of the peace and prosperity of the Messianic age, now that Christ the Saviour is risen among us as foretold by the prophets. Metaphorically milk and honey in the Bible signify wealth and prosperity, especially the spiritual riches and wealth of God's unending kingdom. Therefore, as he blesses the dairy products the priest prays, "As we partake, may we be filled with Your generous gifts and unspeakable goodness." A second kind of cheese is made from cottage cheese and eggs, while in some instances even a third variety from while milk alone is prepared by descendants of people of particular European villages. Eggs were always considered a symbol of the Resurrection, the emergence of new life. On the day of the Resurrection, our Lord came forth unexpectedly from the tomb as the baby chicken after breaking through the shell at its birth. Eggs are a sign of hope. Because of this special meaning, it is fitting that the eggs be specially decorated with symbols of Resurrection Victory. As the ultimate symbol of fertility, the egg is a promise and expectation of new life. Christians see the egg as the shape for the opening in the tomb from which Christ emerges. The hatching of eggs is a potent sign of new life promised to us in the Resurrection. The eggs are colored because of the pious tradition that the Mother of God wanted to take something to Pilate so he would not let Jesus be crucified, but all she had were some eggs. Her gift did her no good. When Mary saw that Jesus was condemned, she began to weep and her tears dyed the eggs into many different colors. Even today, one of the straight strokes in writing eggs is called the tear of Mary. After our Lord's Resurrection, these eggs were a sign of joy, reminding Mary that her Son lives forever. Another pious tradition teaches that Mary Magdalene in her apostolic evangelical journeys went to Rome and presented the pagan ruler with a red egg and thereby showed him how the Resurrection of Christ was possible. In imitation of these two pious women, devoted faithful prepare eggs as a reminder of Christ's glorious victory over death. decorated egg as customary among Orthodox Slavic people are called pisanki which is derived from the infinitive for the verb pisati, "to write." The designs are written on the shell of raw or cooked eggs with wax and dyed in singe or multiple colors. Each village in various areas of Eastern Europe had designs and colors proper to the region. Many designs have their origin in classical Christian symbols such as fish, the cross, the morning rising sun, etc.. Other designs are of pre-Christian origin and were though to bring health, fortune or fertility to the home. The part of the egg that is to remain white is first covered with wax that is drawn or written on by a cone shaped instrument called a kistka, and then the egg is dipped into the dye of the next darker color, usually yellow. Sometimes the women would use a straight pin inserted into the end of a small match-like wooden stick. The dying procedure is repeated through a succession of colors and designs, ending with the darkest dye hue. Finally the wax is removed by holding the egg close to a flame and wiping it with a soft rag. In former times, when coal stoves were prevalent, a wool rag would be held to the hot plates and then used to rub off the wax to reveal the various colors. It is finally polished with a soft cloth. Traditionally, these pisanki are placed into the basket of Paschal foods to be included in the prepared foods. 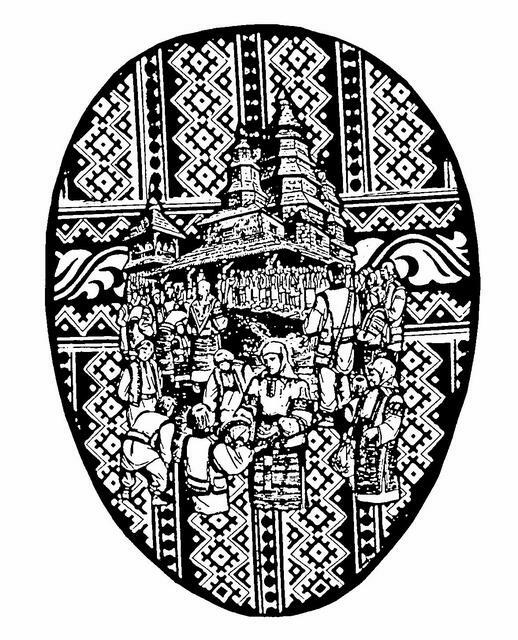 Many times the most ornate or most appealing pisanka was given to the parish priest or to friends as a gift on this sacred holy day. 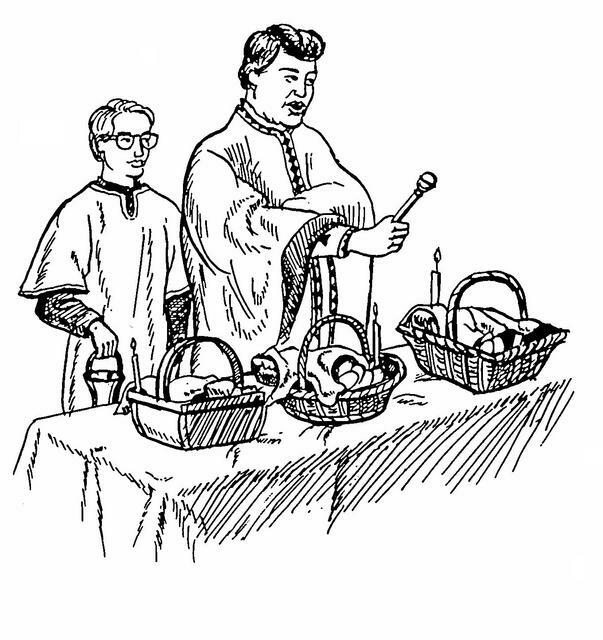 Meat, Ham and Sausage, Veal or Lamb in small portions are placed in the Paschal basket. It is from these products that we have been fasting, some of us entirely and others as much as we can. The Resurrection brings an abrupt end to our fasting. The meat products symbolize the sacrificial animals of the Old Testament, that prepared the way and foreshadowed the true sacrifice of our Saviour for our sins. He is become for us "the Lamb of God Who takes away the sins of the world." Christ is truly the Paschal Lamb by whose blood shed on the Cross we are saved. As we learn from the prayer of blessing, the meat products also symbolize the fattened calf prepared for the Prodigal Son, representing fallen humanity on his return to our heavenly Father. Thus at this time of Resurrection we celebrate our return to God and our joyous participation in the blessings of our Saviour, Who, as promised is our "true food." Meat symbolizes God's favor and blessing and generosity to us. It is reminiscent of the abundant festivity and joy of this magnificent feast day, reminding us of the celebrations in heaven over the return of just one sinner. Ham, particularly pork products, celebrates the new freedom of the New Testament Church which came into effect through Jesus' victory. Sausage is an ethnic addition to enhance the celebration and make it personal; its links remind us of the chains of death which at the gates of the Old Testament place of the righteous dead wire broken and shattered when Christ arose. Salt symbolizes the truth of the message of Christ. Just a salt preserves food, so the teaching of Christ preserves our eternal life. Salt changes and enhances the taste of food, usually making it more appealing. As followers of Christ, we are called to be salt of the earth. It is our vocation, as a response to the Resurrection truth, to change and transform the evil we encounter in the world with the Light of Christ. We are to be an example to the world, to our families, to our loved ones and those with whom we share our neighborhoods and employment. Just as salt preserves food, so the teachings of Christ preserve us for live everlasting. Horseradish is a bitter, hot, spicy tasting root, reminding us of the effect sin has on us. It also reminds us of the bitter gall Christ was given to drink as He thirsted on the Cross. Horseradish is usually mixed with grated red beets to remind us of the Blood of the Passion and suffering Christ which mitigates the effect of sin. It is somewhat sweetened with sugar because of the unlimited hope we are given as a result of the Resurrection. It represents the bitter herbs prescribed for the original Old Testament Passover meal as reminder of the bitterness of life in Egypt. It is also a reminder to us of the bitterness and painful separation from Christ through sin we must so many times suffer with. Wine is the drink of the Paschal celebration and the natural element Jesus used at the Mystical Supper to transform into His precious blood. Its sparkle reminds us of the glory of this feast. Wine gladdens our hearts as the Scripture teaches us and helps us enter into the joy of the Resurrection. It is a reminder on this final miracle in the life of Christ of the very first miracle He performed at the marriage in Cana of Galilee. When it is respectfully and reverently taken as a drink, it may be a reminder of the outpouring of God's life-giving grace. A Candle placed in the basket, ready to be lighted as the food is blessed is reminiscent of Jesus Christ, risen Saviour who proclaimed and identified Himself as Light of the World. It is a reminder of the grace of the true Light present among us and our loved ones as we participate in partaking of the Paschal foods. Our heavenly Father graciously grants us nourishment and strength for life's legitimate needs. The blessing bestowed upon the Paschal food is also bestowed on those souls who participate in the holiness of partaking of them. It is a prayerful request that in celebration we exercise moderation and not eat to excess to displease the Lord, nor to permit the sparkling wine to tempt us to misdeeds. While enjoying the goodness of God's providence in all these foods, believers also remember those who suffer hunger and want. The holy meal should be a reminder that the pleasures and goodness of this life should not stifle the inspiration of the Holy Spirit for us to share our bounty. A very attractive, colorful and usually hand made cover of plain linen is utilized to cover the entire Paschal basket protectively. Many times handed down from generation to generation, generally it is elaborately and delicately embroidered with a figure of the risen Saviour, sometimes accompanied by angelic visitors with the additional greetings of "Christ Is Risen" and its usual response, "Indeed He Is Risen" affixed to it. Some have floral or geometric trims and designs enhancing its beauty. The edges are intricately sewn and trimmed with handmade lace. Once the blessing ceremony is about to begin, it is removed to reveal the food and returned to the Paschal basket for the return trip home.